ARE YOU ABOUT TO BE CAUGHT ON THE WRONG SIDE OF THE 1980 GOLD PLAY? ARE YOU ABOUT TO BE CAUGHT ON THE WRONG SIDE OF THE 1980 GOLD PLAY? OR MISS IT ALTOGETHER BY NOT READING THE JANEWAY LETTER? 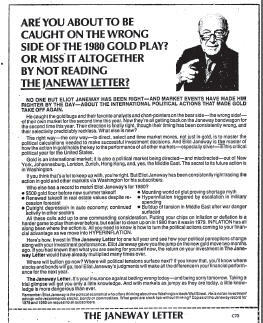 NO ONE BUT ELIOT JANEWAY HAS BEEN RIGHT— AND MARKET EVENTS HAVE MADE HIM RIGHTER BY THE DAY— ABOUT THE INTERNATIONAL POLITICAL ACTIONS THAT MADE GOLD TAKE OFF AGAIN. He caught the gold bugs and their favorite analysts and chart-pointers on the bear side—the wrong side! — of their own market for the second time this year. Now they’re all getting back on the Janeway bandwagon for the second time this year. Their direction is finally right, though their timing has been consistently wrong, and their selectivity predictably reckless. What else is new? The right way — the only way — to direct, select and time market moves, not just in gold, is to master the political calculations needed to make successful investment decisions. And Eliot Janeway is the master of how the action in gold holds the key to the performance of all other markets—especially silver— in this critical political year for the United States. One of my subscribers, who’s among the top five financial copywriters today, put me on the spot about the numbers from this promotion. It’s a romantic notion to think that Dan Rosenthal rode off into the sunset with millions in royalties from just a few days of work, but it seems unlikely. I’d gotten this info from one of Clayton Makepeace’s contributors a few years ago and taken it as fact. Lesson? Trust but verify! Trust but verify! This is a very good letter but not of blockbuster caliber and the numbers do not seem to add up. So, I retract everything beneath the line. And by the way, Dan is alive, well and still working, according to an acquaintance who met him for lunch in the Far East a few weeks ago. This is Dan Rosenthal’s direct mail piece that brought in $12 million in orders in a few weeks. The story goes that Dan went to the publisher with the idea, took two weeks to write and polish it and then walked away with 30% of the take. No graphic design, no sidebars — just a 5-page paper-and-ink sales letter with a 1-page response form. This is one of the all-time great sales letter openers for a financial newsletter. 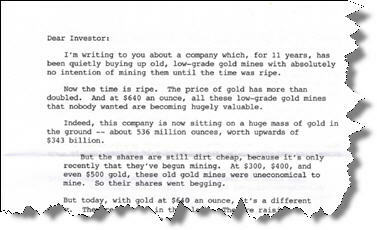 And with the price of gold closing in on three times the price per ounce when this letter mailed, it packs even more of a wallop. And here’s one of his print ads for the Silver & Gold Report. Dan Rosenthal is not only one of the legends of financial copywriting but he’s one of my all time favorite print ad copywriters. 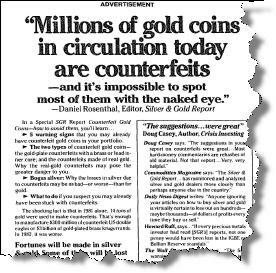 This space ad for the Silver & Gold Report had insertions 25 years ago. I could easily see this in print today with few modifications.